I feel like I am sooo late in uploading this as I literally have not been able to take pictures as I have been sooooo crazy busy with work. Finally I managed to take some pictures and I know this is probably the 100th blog post you have read about this, but I wanted to talk about it anyway. 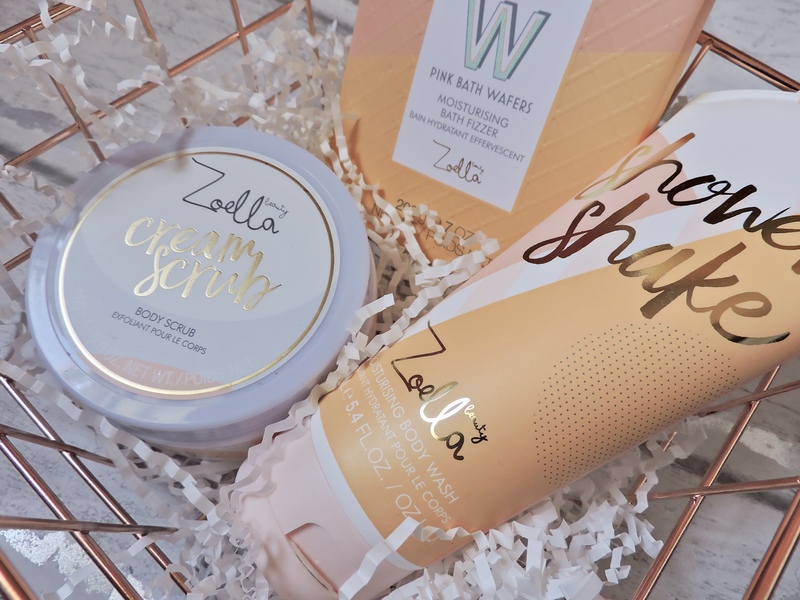 Zoella ( I am SURE you know who she is ) released her new beauty range!! Jelly & Gelato and IT IS INCREDIBLE! Her new range was inspired by jelly and ice-cream (state the obvious lol) and it smells like elderflower and double cream. It is a very fresh summery scent, not too sweet and sickly. I think it is probably my favourite scent from any of her ranges. The elderflower and double cream go really well together and i am obsessed! I have never smelt anything like this before, so it is really refreshing to smell something that is unique and really one of a kind. The range in general is stunning and I feel really proud of her to have created such amazing products with beautiful scents and stunning packaging. I brought three products from her range because these were the ones that sounded most interesting to me. They have been out for about 3 weeks now, I ordered mine online before they were in stores yet because I literally couldn’t wait! So, I have had these for about 3 weeks without being able to use them, do you feel my pain?! 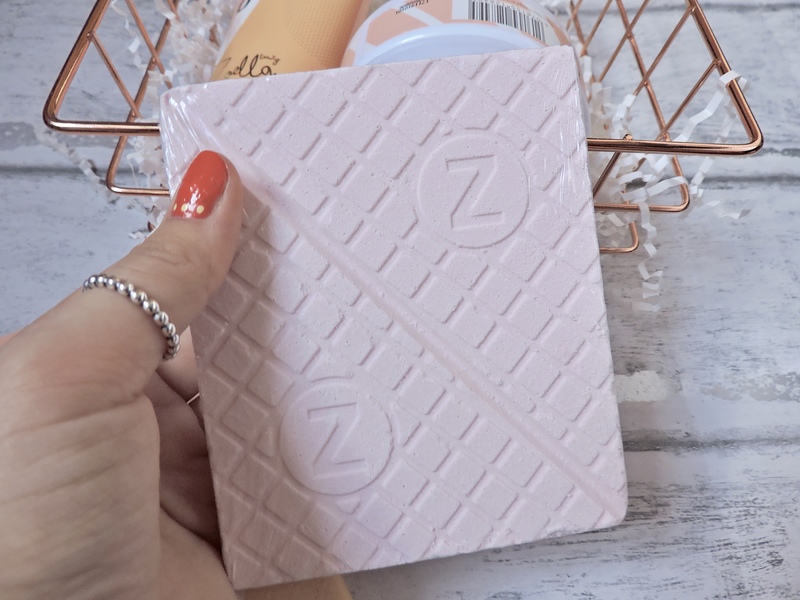 This is her first range that is actually going to be in other countries, so for those of you that aren’t In the UK and love Zoella then you will be happy to hear that you can now get her products from your country! So I brought the Pink Bath Wafers £5.00, Creamy Scrub Body Scrub £8.00 and the Shower Shake Body Wash £6.00. OMG I ADORE THIS PACKAGING! I think it is so cute that a little straw has been added to this shower shake, obviously because it is a ‘shake’ and you normally have a straw when drinking a milk shake. I think this is such a cute touch to add as it is very Zoey! I love the colours that have been used throughout this whole range. For this product the pastel orange and pink colours go really well together and they are actually my favourite colours. The font is written in gold foil writing which adds a nice touch to the packaging as it is pretty and looks lovely when it catches the light. The packaing is really bright and different to anything else i have ever seen, that it will make you want to buy it as soon as you see it. The colours and the fact that they pastel are really in at the moment which i think it great. It smells amazing, I can’t even explain to you how amazing it smells. If you already have her products then let me know in the comments below if you like the scent. There is a seel over the product so none of the contents can leak anywhere, which i think is the first time she has done this but im not 100% sure, so correct me if i am wrong. I love that she did this, i think it goes up and above the line of what is expected. When you squeeze the product out, a lovely orange colour comes out and it is the same colour as the packaging. Then when you rub it in it turns white and foams up. It isnt too foamy but foamy enough, you can add more product if you are one of those people that loves a foamy shower gel. 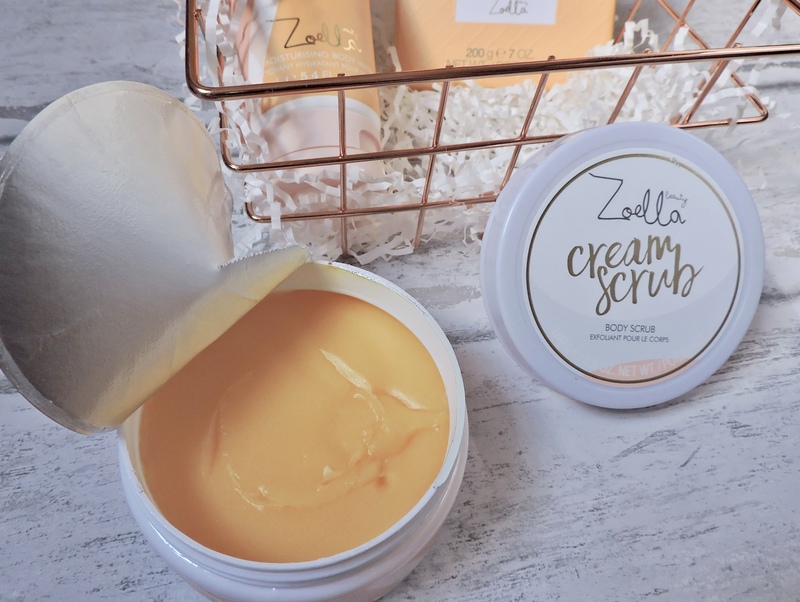 One thing that comes to mind when I think about some of Zoellas products is that they are very moisturing, she definitely hits the nail on the head with that part. This one was also very moisturising aswell, which i loved. It leaves your skin smelling gorgeous and feeling really soft and moisturised. My skin always feels really refreshed and just throughly washed. I love this packaging. I love the light blue/purple colour, I think it is such a lovely calming colour. I really like that this scrub has been done in a circular tub as I like that the lid screws on. Again, there is a seal over the product so nothing can leak. You can tell that each product was designed differently from the little touches to each product, such as the white and pink stripes going around the bottom of the tub, or the lighter circle going around the font on the front of the lid. These are only tiny things that make each product unique. I would loved to have seen this scrub a tiny bit bigger, just because her scrub from her Tutty Fruity range was like double this size. There is alot of product inside and it is heavy dont get me wrong, but i just think it could have been bigger. Nevertheless, this is going to last me such a long time and i know that when i finish i will be so sad! Body scrubs are probably my favourite sort of body product. I sometimes get really bad dry skin and I find that scrubs help a lot. I have used some of her scrubs before and they are some of the best ones I have ever tried. I love the texture of this scrub, it has a really balmy texture. It is really thick but when you rub it onto your skin it evens out well. There are also alot of sand granuel inside, which i love as i hate it when there isnt enough inside. You know that this scrub is going to get every litte bit of dead skin off of your body for sure! I love that the texture is a bit thicker to her normal ones, so you can really scoop it out and you literally feel like you are having a proper scoop of product. It is also VERY moisturising, this is going to be perfect in the winter. I think this packaging is super cute. I love the idea of their being a wafer to symbolise a wafer from the top of an ice cream. Once again I love the orange and pink pastel colours together. There are little imprints of lines going over each other, a bit like an ice cream cone. Im not good at exapling, I am sure that you can see from the picture lol. The font is different to the other products that I have, it has a really cool W that is outlined with Blue. I think this just adds some more colour to the packaging and it just looks cool. One thing I have to say about all of the products, especially this one is that it is packaged really really well. There was like 2 big stickers on each side of the ends to stop the packaging from unwrapping itself and it took me a good couple of mintues to try and get the wafers out of the packet, which is a good sign I think! This is the only product that I haven’t actually tried, partly because it is too cute to use but also because i want to save it for a real special occasion as I am expecting big things. The product itself is really quite heavy, so you know that the wafer is going to be thick. You don’t necessarily have to have this with just two baths, you could break bits off to use in multiple baths. There are two Z’s engraved into the wafers which i think is a cute touch and it also has little squares on it. It is just a really pretty product and on the back and front it says that it is a moisturing bath fizzer, which makes me super happy! I ABSOLUTELY LOVED every single product that I got, I still have a cheeky browse at all of the other products and to be honest I probably will end up buying the whole range. All of the products are VERY well made, they smell gorgeous, they are beautifully designed and very well packaged. Her products are really affordable, and you are paying for what you are getting. You can tell that she had put a lot of thought into what products she wanted, how she wanted them to look and what she wanted them to do for people/the results. Have you tried the Jelly & Gelato range? what was your favourite item? what would you recommend? YOU NEED TO! I can’t even explain how obsessed I am with it. The packaging is right on point!! This range looks so nice! I think her packaging is always fab but the whole marketing campaign on this one has been the best! 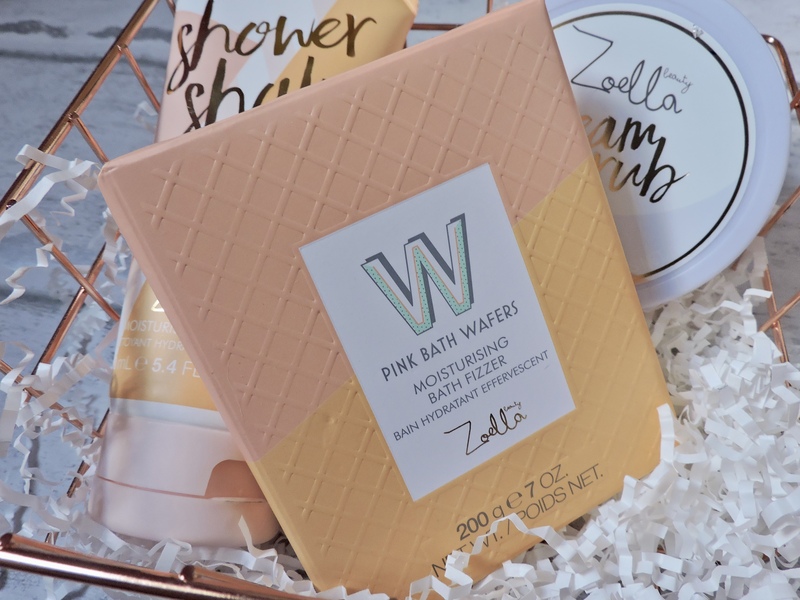 Anything with Zoella’s name on it is always adorable!! These seem really neat! 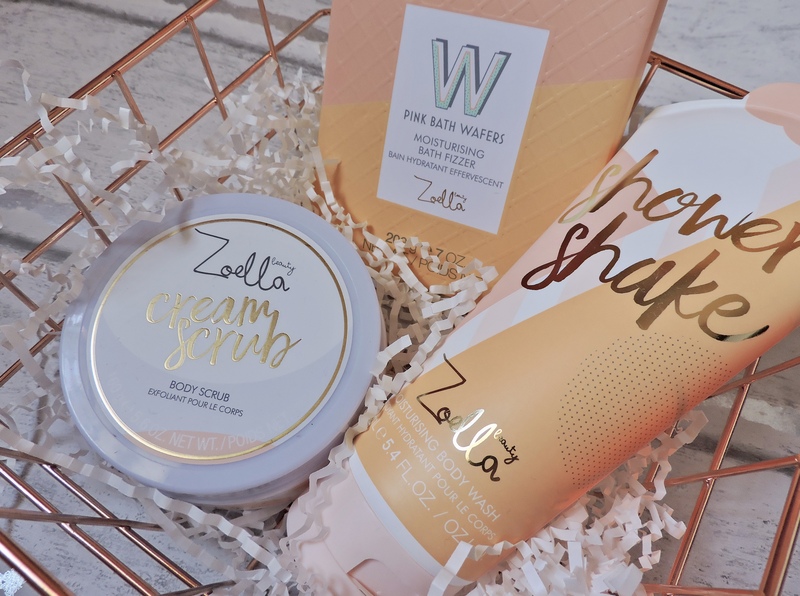 I have never heard of Zoella, but these products look awesome. Especially the creamy scrub. Just looking at it makes me want to reach in and grab a glob. I feel like I would like the texture. lol I agree that the packaging is super cute as well. HAVEN’T YOU?! NO WAY. These products are amazing. Maybe you should check her out, she is amazing on youtube and she is such a brill blogger. The texture is really good, I enjoy using it so much! from any of her ranges??! she releases really nice products, you can tell she has thought about what she really wants people to buy! Nope! I’m quite angry I haven’t ever picked some up haha! And I think thats my favourite thing! She clearly doesn’t do everything for money, but just wants her viewers to like her products! It definitely does! I’m going to try and get into town this week and pick up some pieces! I’ve not tried this range yet but it looks amazing! I haven’t tried the range yet but I just know it’ll be amazing. She tops herself every time!! it is sooo good! I agree. Every range that she brings out is better than the last one! 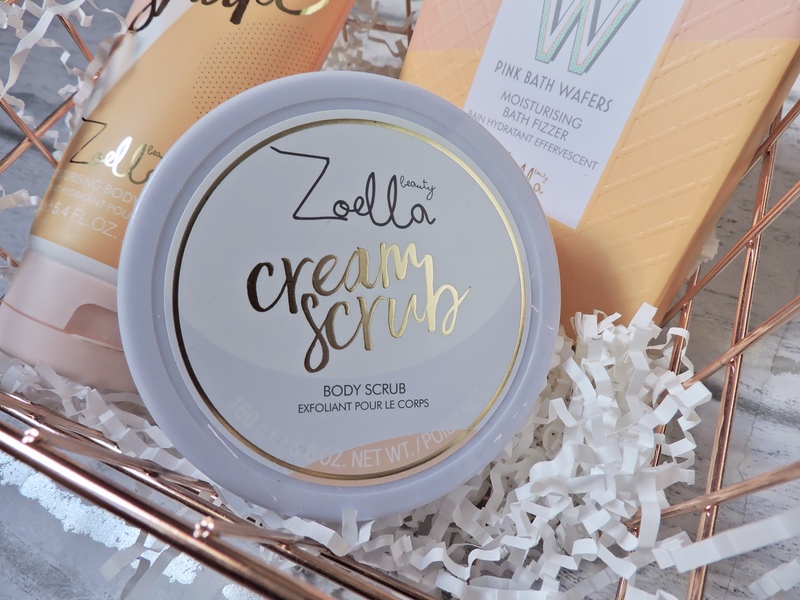 I have never tried any of Zoella’s products but now I might just have to! I have been watching Zoella’s vlogs much more often recently and she was showing her products in one which really caught my attention. They really do look amazing! I didn’t notice the straw in her video though and that’s such a great detail! THEY SMELL SO AMAZING! The fragrance aswell lasts forever! I didn’t buy it but I smelt it the other day and I wish I had now! These products look awesome! I’ve only tried a few items from this line but I definitely wasn’t disappointed. Beautiful post and blog! Isn’t it? I dont think she could have done it better and same haha! you should, omg girl you would love them!! I live in the US and wish I could go to a store to smell the products! I want the perfume but am a little hesitant to buy it online without smelling it. I think it will only be available online. I might just have to take my chances and just order it. I think I will love the scent. If you like the scent you haaaave to buy the body spritz.. Its amazing! Just like all her other spritz’ you pop it on in the morning and can still smell it in the evening! It’s so lovely! Great post by the way, definitely think I’ll have to buy the scrub after your glittering review!